Trilogies have beenwiped off the face of North Carolina Dance Theatre brochures as the company's new season begins, replaced by catchier program titles. So instead of a Fall Trilogy, NCDT began its new season last week with Red Hot "n' Bluegrass, featuring less high-falutin' product labeling. Inside the friendlier packaging, the initial contents of the NCDT program weren't radical departures from the past. A venerable oldie choreographed by Alvin Ailey, The River, started us off, followed by a world premiere from Nicolo Fonte, Brave! Yes, there was a third piece, whisked prematurely from the oven by NCDT artistic director Jean-Pierre Bonnefoux. There might have been a whiff of deja vu in the Fonte piece since the Brooklyn choreographer's Spoken in Red had its American debut in the 2002 Fall Trilogy. We didn't get many other peeps at the face of 21st Century dance last season on the Belk stage, and the oddball Brave! will be standing alone this year. Jason Jacobs was at the forefront, blithely perched atop a stool and jubilantly declaiming a trite paean to love. Equally scintillating were Uri Sands, Nicholle-Rochelle and an ensemble that coped nonchalantly with a phalanx of stools that spanned the downstage area. The humor, passion, personality and daring athleticism of the dancers were in stark contrast to Fonte's Red, which bounced men and women off each other like impersonal atomic particles, never connecting in the lurid darkness. Perhaps Fonte was subtly presenting a flipside for 2003: the foolhardy delusion of connecting. NCDT's Ailey encounter was more of a stretch for the company -- and less of a triumph. The piece is danced to a rare symphonic score by Duke Ellington. 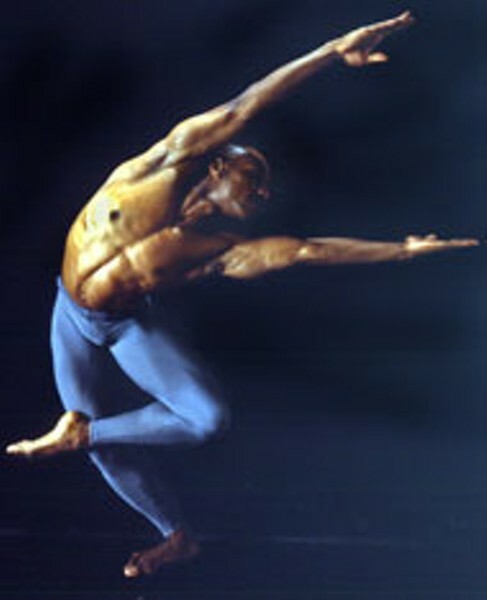 Mixing ballet with jazz and modern styles, Ailey's choreography occasionally seemed to disorient the soloists. Even the divine Kati Hanlon Mayo seemed a tad tentative in "Vortex." Partnering with Uri Sands in the closing "Twin Cities," Mayo re-ascended her throne. Sands opened powerfully in "Spring," Rebecca Carmazzi and Sasha Janes sparkled to the Latin beat of "Lake," and Jacobs injected his humor into "Riba." This was an awesome addition to NCDT's repertoire, one worth continued effort and refinement. But during the first pass through The River, it occasionally felt like white folk were trespassing on the property. Bonnefoux's Shindig, rushed in to replace the canceled world premiere of Mark Godden's Double Blind, was a spirited, valiant rescue. Bonnefoux could hardly do otherwise, since this was the bluegrass portion of the bill and the Greasy Beans quartet was already booked. Watching Rochelle perform an unbroken series of ballet spins to Bill Monroe's "Nine Pound Hammer," I'd have to say that parts of Bonnefoux's new hoedown looked more like a strained shotgun wedding than a joyous shindig. Yes, this was a bold departure. We moved convincingly from the Pyrenees to Appalachia when the Beans fired up "Pistolerro" while Jacobs, Janes, Patrick Kastoff, Benjamin Kubie and Daniel Wiley strutted their stuff. It was at this moment that the tall gentleman sitting in front of me came suddenly to life, clapping heartily to the rhythm. Until then, he'd done nothing all evening but split my view of the stage. Obviously, Bonnefoux & Co. were straying out of their comfort zones to find this fella's. The disorientation persisted when a square-dance club came onstage after the final curtain call and joined audience and NCDT troupers in an impromptu demo. Bonnefoux looked at the invasion with a huge smile that seemed to be masking mortal terror. NCDT's newfound folksiness and juiced-up commercialism will need more work. My third timearound with A.R. Gurney's Sylvia was less fascinating than earlier encounters. I didn't find myself contemplating the truth contained in the fanciful exchanges between man and dog. But I enjoyed the current Off-Tryon Theatre Company version every bit as much as the off-Broadway version and the Charlotte Rep remake that came sniffing afterwards. Director Glenn T. Griffin's terrific design concept featured a set with so much of Charles Schultz's blue and brown in its trees and sky that I almost felt undressed without a Snoopy security blanket. Sound design, featuring Vince Guaraldi and The Beatles (including the inevitable "Hard Day's Night" dog reference), deftly chimes with the prevailing whimsy. But it's the wacky chemistry between Lee Thomas as Greg and Meghan Lowther as Sylvia that knocks me silly. Lowther's poochy energy is younger and goofier than Jan Hooks's was off-Broadway, and her comparative lack of sexiness becomes a comical asset when Sylvia goes into heat. Thomas is a more cuddly and shambling dog lover than I've seen opposite Sylv, making his midlife crisis more emotional and less cerebral. Concentration by Thomas and Lowther brings them both to breakthrough levels, but don't overlook the third leg of this triangle, Donna Scott as Greg's jealous wife Kate. So there's plenty going for Off-Tryon's Sylvia -- plus the extra doggy treat of Gurney's wry empathy if you're discovering this gem for the first time. North CarolinaShakespeare Festival has tightened its belt to anorexic levels, slimming down to two productions and one set. But the 2003 Equity troupe is strong, and The Merchant of Venice, directed by longtime Charlotte Rep mainstay Randell Haynes, is the edgiest piece I've seen in years up in High Point. Hugh O'Gorman stresses the title character's anti-Semitism, as is common in contemporary revivals. But Allan Edwards delivers his most richly nuanced performance in years as Shylock -- in an unflinching Jewish accent -- giving telling weight to both the moneylender's greed and his just resentment. Josh Gaffga manages to keep Bassanio heroic and astonishingly sincere, while Sarah McCafrey is the sauciest Portia you'll ever see. Too much flesh is taken from the script in reducing running time to 2:17, but the damage is never serious. Edwards, Gaffga and McCafrey -- all past CL Theatre Award winners -- keep the ancient dialogue clear enough for even first-time visitors to Shakespeare's world.